Crater Lake in winter: we had the pristine views all to ourselves, even during Spring Break week. 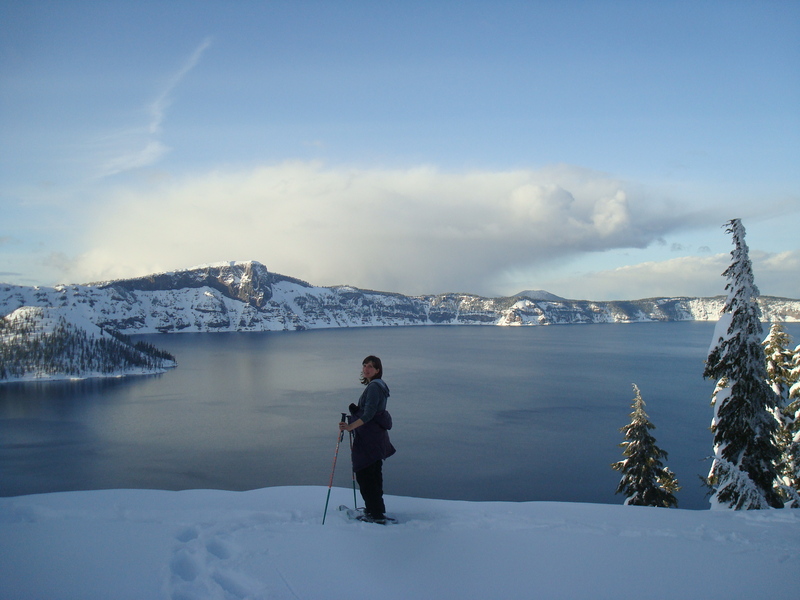 It’s spring break here, but we did not fight the crowds during our wintertime trip to Crater Lake. Oregon’s only national park (with free entry! )–and apparently the country’s deepest lake (almost 2,000 feet deep)–is more popular with summertime campers. But the park’s also a 7,000-foot high wintertime wonderland through May. The snow-covered lake views also seem more spectacular. Cross-country skiers like to circle the lake’s entire 33-mile rim. But we’re not intrepid outdoors-folk, and I’m 27 weeks pregnant, so snowshoeing is our preferred kind of low-commitment sport. Plus, it doesn’t require a roof rack to transport the minimal equipment. 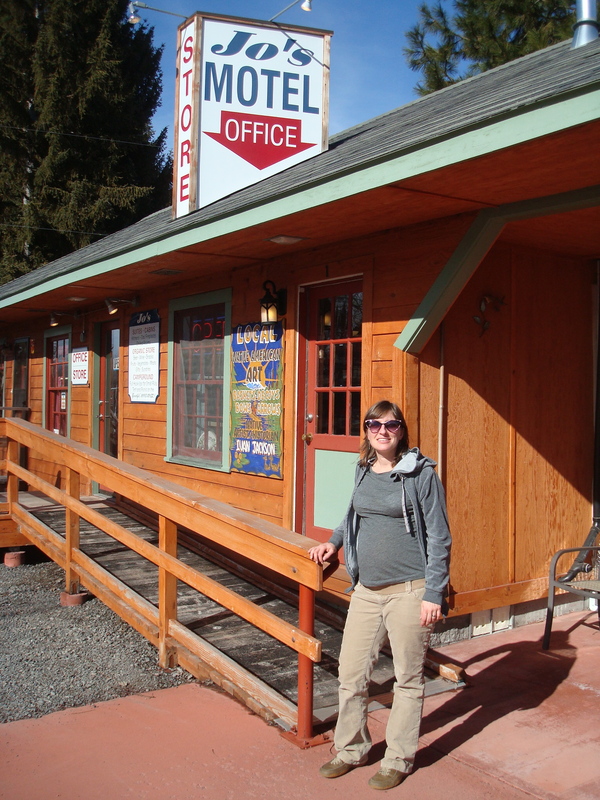 Jo's Motel: Cozy lodging and great source of organic co-op-style food in Fort Klamath. Fortunately, we had clear views of the lake, which clouds and snowstorms obscure half the time this time of year. The 3-mile road to Rim Drive was closed, however, due to avalanche risk (gulp!). We played it safe and took the easy, well-compacted snowshoe route up to the top. And what a pristine view we had all to ourselves when we arrived at about 6 p.m. 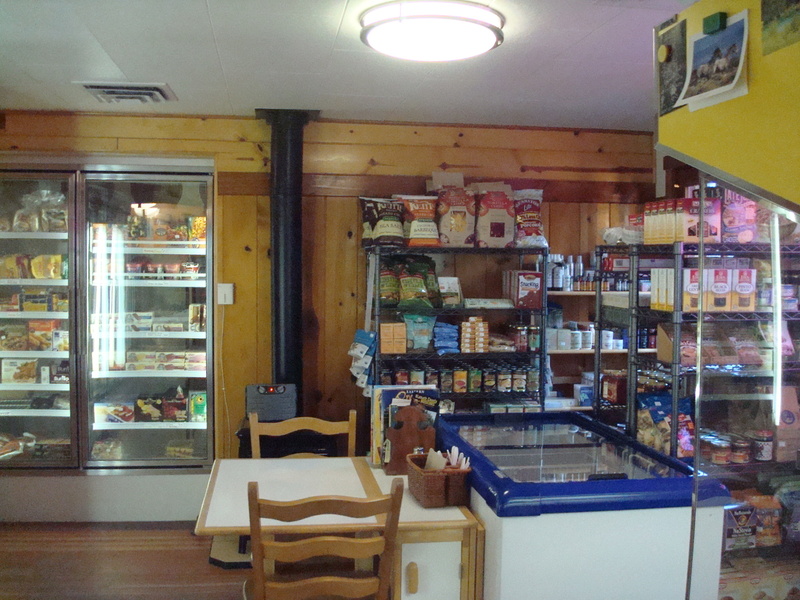 The plentiful organic groceries at Jo's Motel in Fort Klamath. Lodging options are limited this time of year. We were thrilled when our friends recommended Jo’s Motel in nearby hard-up (practically a ghost town) Fort Klamath. Innkeepers Robin and Jim (who used to live near Corvallis) offer an unlikely oasis of organic foods and homey accommodations, with no phones or Wi-Fi but all the free classic DVDs you could care to rent. We had the peaceful retreat to ourselves and could have stayed a third night free had Dan not had to get back. You can get a suite with a kitchen and cook up items procured from Jo’s well-stocked (if not expensive) grocery, but we came to relax. So Robin and Jim cooked us up organic eggs, hash browns, sausage and creamy, fair-trade hot cocoa for breakfast. They also grill up free-range burgers and serve salads tossed with Jo’s tangy house balsamic-blue cheese vinaigrette. Their fermented dill pickle slices reminded me that a good pickle makes a sandwich or burger. Jo’s Motel is the place to stay when you head to the Lake. Love Crate Lake, Oregon’s only National Park. Have enjoy some wonderful times in the park. Rim drive usually opens in the summer. The large amount of winter snow is unreal around the lake. The park does not have free admission, normally. admission days across the USA. New to your fine blog and look forward to reading about your journeys and trying some of the recipes.